Guitar Tutorial - Tremolo arm techniques for non-Floyd Rose players. - Producer, Musician, Artist. Guitar Tutorial - Tremolo arm techniques for non-Floyd Rose players. Today I'd like to share with you a little technique concept that I haven't been exploring for a while. I used to be a fan of tremolo bridges for a while , not so much anymore ... but as I set up my only tremolo-enabled guitar I decided to give it a go and share some of the techniques I've explored and used for quite some years. When I started out I was heavly influenced by players like Steve Vai and Satriani , who are known to be Floyd-Rose type tremolo users and have a series of techniques relying on that system . Heavy dive-bombs , Pull-up harmonics and such , so when I purchased my first ''good'' guitar I went for a Floyd Rose equipped guitar and... HATED IT! . Never clicked with me I guess.. so I went to playing a fixed-bridge strat for many years .. in fact a non-tremolo strat is still my main guitar ... but after ''discovering'' another breed of players like : Michael Lee Firkins, Scott Henderson, Carl Verheyen and the master of all Jeff Beck I wanted to give it a 2nd try. 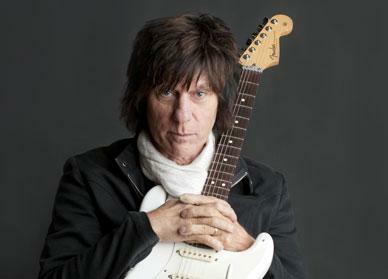 ''One of the big bosses...Jeff Beck!" How do I set-up my non-locking bridge so it doesn't go out of tune? Chord transitions and passages are more expressive. This type of clean and lush chording is very pleasant to my ears, I first heard this type of voicings from my guitar here Michael Landau combined with volume swells and effects he sets up some really nice soundscapes. You get an extra tool to manipulate a melody. Even if it's subtle use of the tremolo arm , there is more capacity to manipulate a melody and make it a little more ''vocal'' , when you have a fixed bridge there is no practical way to decrease a note in pitch, we can slide into a note, bend and do vibrato but the tremolo arm lets of do ''note depressions'' , glissandos, and in a way make a melody more ''liquid'' , I particularly enjoy looking for more ways to express a melody. The master at this to me is without a doubt Jeff Beck. You can fake some slide playing sounds without using one at all! Ok ... it's not really slide.. I know! but at least i can get a little closer , I love players like Derek Trucks and Sonny Landreth for their slide playing but I've tried playing slide, failed, tried again, failed and after breaking at least 3 glass slides I gave up . Later when finding players like Scott Henderson and Jimmy Herring I got into this ''fake slide'' type of playing that I enjoy from time to time. Getting into tremolo world can get you ''between'' the frets and reach for some microtones associated with eastern music. Also, this ''koto'' technique as I've seen it called can get you sounding a bit like an ethnic instrument. You can always explore more , a good guitar player that has delved into this world of sounds is Dave Fiuczynski. Well , that wraps it out for today! , these are just some sound ideas you can explore with a simple strat tremolo system that I have somewhat included into my playing, though now I mostly play a fixed bridge guitar it's fun to go back and check some of these sounds again. What are your thoughts on Tremolo equipped guitars? How do you use it? Thanks for reading and listening! Signing off!